I’m often in amazement of the simple meals I manage to put together. Really, did I just make something taste freakin’ amazing out of the humble crap I found in my fridge? When I found myself with some defrosted chicken thighs, a half bottle of riesling and a bit of heavy cream, I saw a recipe that looked like it would be an ideal fit. Chicken braised in wine, accompanied by root vegetables and kissed with cream. Perfect comfort food for a chilly evening. Now the photos don’t do this meal any justice. Fall and winter evenings with dim lighting do not make for appetizing or tantalizing shots. Instead you get those weirdly orange photos that look more at home in a thrifted cookbook from the 1970s. But that’s okay because you’ll just have to take my word that this meal was incredible. In fact, I think it’s the best single meal I’ve ever ever ever cooked in my life. High praise indeed. This meal was so good it should have been shared with friends or at least with a little candlelight and cloth napkins. 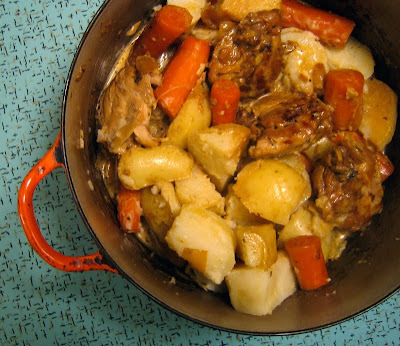 It’s humble in it’s main ingredients: chicken thighs, carrots, shallots, potatoes. But it’s the riesling and cream that make you want to shout out to the world. So go on, pat yourself on the back and dig in. 1. 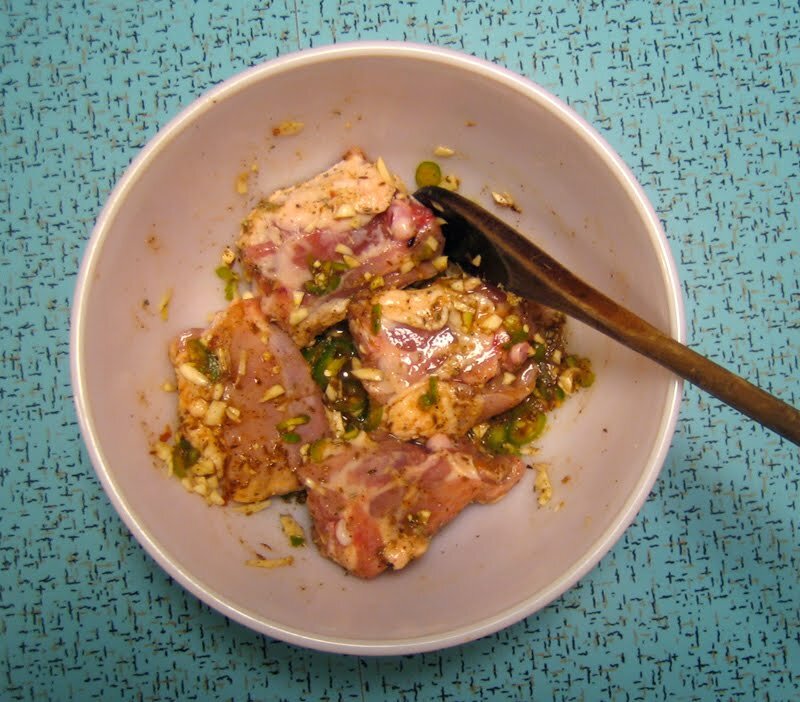 Rinse and pat dry chicken thighs and add them to a bowl with the garlic, serrano peppers, oregano, cumin and lemon juice. Stir and let sit for 30 minutes. Heat olive oil over med-high heat, and add in chicken and marinating liquid. Brown chicken on all sides. Remove from pot and set aside. 2. Heat butter and saute shallots and carrots for a few minutes and add chicken back into the pot. Pour riesling over top and cover over med-low heat until chicken is cooked through, about 30 minutes or so. 3. Meanwhile, cook potatoes separately in boiling water until just tender. Drain and add to the chicken pot. Add in heavy cream and lemon juice, stirring gently so everything gets coated. Serves 2 very hungry people or 4 people with small appetites. wow, this looks so good!! i will have to make this soon – in fact, perhaps tomorrow, i have chicken thighs defrosting! I knew I should have bought potatoes yesterday! This looks amazing, and I have everything else on hand. Doh! cooking with wine is my new favorite thing. it's not new to everyone else, i know, but i'm young yet! my chicken and veggies tonight could really have benefited from this treatment. it looks so good! i know we just met, but…do you want to be friends? you could cook, we could enjoy meals together, i would tell you how good it tastes. seriously…from one vacouverite to another looks very yummy! Sounds great! This is a keeper for when the in-laws stop by! oh yum…chicken in riesling! I read Nigella Lawson's recipe, a variation on coq au vin. Hers was a little bit more involved though. I love the simplicity of your version and riesling is my favourite wine. I have to try this! Um, yeah – the orange light? Is it avoidable? Not for me, and thus, all my photos would be right at home in "Microwave Cooking" or something from 1982. However, this looked extremely appetizing, even in the gloaming – I am mad that it's after midnight and I can't have it RIGHT NOW. Could you please move next-door? Man, photographing food is the worst sometimes. I can't count the number of times I've finished dinner and thought 'damnit, I didn't take any pictures!' I don't eat meat, but I do know the satisfaction of putting together something aweseome from things you've scrounged from the bottom of the vegetable drawer and the back of the freezer. I also love cooking with wine, but I so rarely have any left! Whew, those are some hefty compliments that you have given this dish! Well if you like it so much, I'm gonna have to trust you and make it sooner rather than later! i have made the original version, although with more broth and more creme fraiche. i like it saucy! The combo of leeks and wine and creme fraiche are TO DIE FOR! If you haven't tried it that way I highly recommend it. I'm totally intrigued by the spices and pepper additions you have here. Looks tasty … and I have frozen chicken (breasts) that I've been meaning to use. Thanks to a late morning start today, I may just toss it all in the slow cooker and pick up some cream on the way home. This is a perfect Sunday meal—a one-pot dish of comfort food that I’ll return to pick at all day long. Yum! I love it when those dishes happen. You make something that you figure is going to be humble and then it just blows your mind! I definitely think this recipe is one of those! That looks and sounds great…and I trust you when you say it is the best ever! I am going to try it my little le crueset pot. BTW I love those cheezy 70's food photography! i so want to make this. thanks for sharing! You've sold me on this one!! Making a list of ingredients & looking forward to drinking the rest of the reisling…. If your camera has white balance, turn it to the tungsten (inside house light unless it's fluorescent in which case hit the fluorescent button) setting. The orange will go away. The chicken thigh is an under-rated bit of delicious. This looks lovely. just have to post another comment and say i'm making this tonight for company. thanks so much again! Radish, it is good! I hope you made it and if so, tell me how it went! Bijoux, this is def in-law friendly. Sharmila, ah the danger of food blogs! Shutterbean, it can be good! Rach, I seem to have half empty bottles lately. Not sure what that means! thanks for liking the gloaming, emvandee! Joanne, all true. Make it stat. Foodmath, sounds like the beginnings of a wonderful meal. Jennifer, it is perfect. And there will be lots of picking. Yum. Aimee, I'm glad. Drinking while cooking is always encouraged. Dawna, I love chicken thighs. So tender and easy to work with. Thanks for the photo tip, anon. Kristi, I hope your company loves it! Fill me in! I love simple recipes. This recipe reminds me of winter. Must get chicken. Am I crazy for wanting to make a vegetarian version of this dish? I'm thinking of replacing the chicken thighs with a few cups of white beans. Crazy? Delicious? I know I'll miss the lovely texture of meat, but the flavors…still lovely? Other ideas? Rosiecat, I love your idea! Try it out and let me know how it turns out. I'm sure it will be tasty. Hi! I have just found your blog again after I lost all my links in my own upgrade. Love the new look, and the search feature! This dish is, as you say, not photogenic – but very delish. I made it on the weekend. Yum, says my husband and I! I have taken the liberty of adding this recipe to my own blog, but have tried to re-word it where I could, as you’ve requested. Thanks! I have added this to my favorites! I jotted it down incorrectly the first time I made it and added the wine at the end with the cream. It’s a little more soupy but I have made it again with the “mistake” it was so delicious. Thanks for a great recipe! We made this last night…incredible. 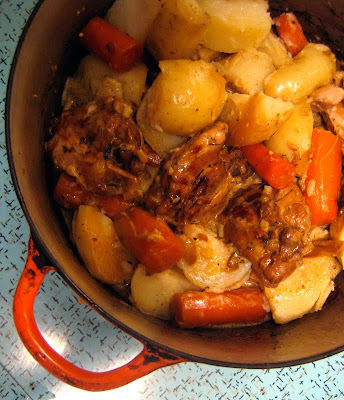 Just as you stated – terrific comfort food on a cold night. Thanks again! We are hungry enough to finish this but love it enough to want it for lunch tomorrow. Is there a slow cooker version of this? I always over/undercook things in my slow cooker. So if anyone has the appropriate instructions to make this meal in one- i’d LOVE it. This meal looks like my husbands dream come true in a pot. Hi Lisa Marie, sorry I don’t have a slow cooker so I can’t help out here! Good luck.